Marketers must understand these stages, as well as the pitfalls in each stage, to be successful in the new marketing era. 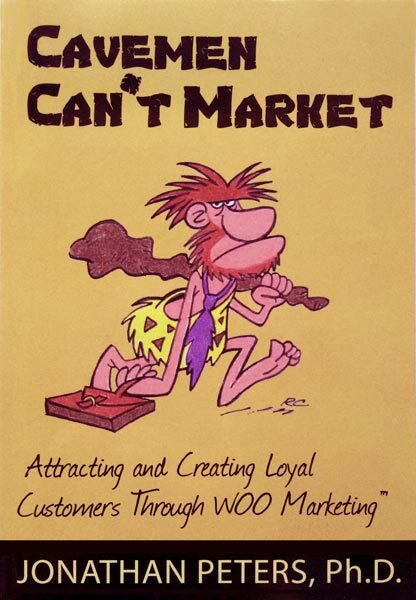 In Cavemen Can't Market, Jonathan Peters, Ph.D. not only exposes why Cavemen don't fit into the current business and consumer environment, but he also maps a way to WOO our prospects, develop loyal customers, and lead our team to apply the latest in marketing approaches. Marketing and advertising changed little over the ages. Despite massive changes in the market position of customers and how we communicate with each other, most companies still use Caveman Era marketing tactics. A few marketers understand that the game has changed. Instead of hitting customers over the head with ad after ad, they go to potential customers where they are. Once there, they begin a relationship with prospects, in essences courting them. Cavemen Can't Market uses the analogy of a Suitor courting, or WOOing, an Intended to not only become a customer, but to move that customer through stages of commitments until she is not only loyal to him, but also makes him part of her identity. In the end, she will market for the Suitor, sharing with her friends what a wonderful Suitor she has.